Click on the spoiler if you want the ID's for the weapon, and ammo. Really? Are you sure you want to cheat? Click on the next spoiler if you are. Weapon ID: xx000802 (xx0051a4 in the Unmarked Quest version). Replace the x with the number of the load order the mod are in your copy of FO3. You can find it under "Plugins" in NMM. In the top where it says "Load Order"; follow it down to where the X277.esp are. Use that number instead of x. Taking this along with a reinforced stealth armor mod and replacing the Enclave Hellfire dudes. The Enclave will now have stealthed assassins carrying this bad boy, waiting to pick me off next time I harass one of their encampments. When using the unmarked quest version the game crashes when I click on the note, and using the other version the gun is completely untextured, it's just a flat grey mesh. I love the idea behind the mod, and the pictures make it look amazing, but I can't get it to work, so I'm afraid I'll have to give it a pass. I have the same problem with the non-quest version. It's untextured so I can't pick it up. I tried using archiveinvalidation invalidated but that didn't work. It looks like a great mod though! Archive Invalidation worked, now it's fully textured and I love it! I've been headshotting Hellfire Troopers with it, very fun. It *is* a little overpowered, though. 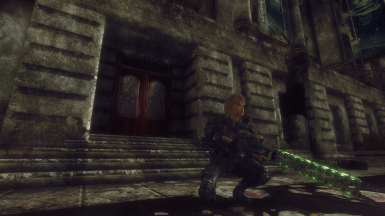 It's not really feasible as a normal gameplay weapon, but as a fun mod weapon it's perfect. 4.5/5. @Selacha: I have made it to work like the YCS-186 and the AM rifle from NV. But because there is less sneak damage in FO3, I had to give it more damage. It give more damage in open play (when your not in sneak mode) then in NV, hehe. I guess not everyone think NV should be in FO3. Well yes, the damage is incredibly high, but I was also referring to the sight. I don't know if you did it on purpose or not, but it's not a variable sight; the dot literally doesn't waver at all, making it a perfect shot. That alone makes it almost incredibly overpowered, since the best sight in the vanilla game is the Reservist's Rifle, which still has a very slight amount of movement for realism's sake. Perfect headshots every time is OP, even if it didn't do a lot of damage. This is all about the small gun/energy weapon stats you got, and the condition of the weapon you are using. - If you got 100, and a gun in full condition it doesn't move. Same as in NV, where you also have to have the appropriate strength to hold the aim straight. - if you got that it doesn't move neither (or so little, so it really doesn't have any effect). 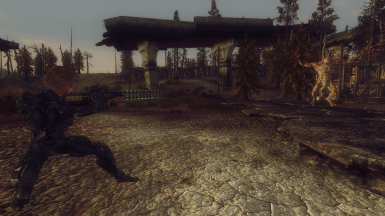 I really think that Obsidian nailed the sniper aspect in NV, compared to Bethesda in FO3. Which is why I stated to make sniper mods for FO3. - I wanted the same feeling as I got in the other game. man this is so cool o___o how i wish this was also on New Vegas as a replacer for the YCS-186 because this gun looks like a damn beast. Would you mind If I converted it to work for NV? I'll give you all the credit of course. I actually don't know if it's allowed just to port it directly over to NV. 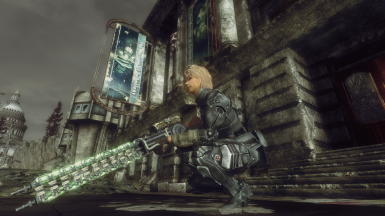 As I have used FO3 assets there isn't available in NV, to make the weapon. 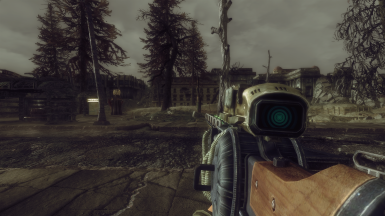 The gauss rifle is the one from FO3. And the one from NV is the YCS-186. Which looks a bit different. I don't know the exact rules about porting. But my understanding is, thet you only can port if it is a completely new thing, or if you have modified it to an extent that it is unrecognizable as an original part. 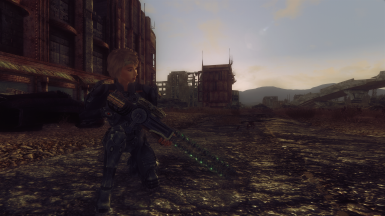 IIRC you can convert it to work with FNV but you'll need to link to this mod for the "assets". 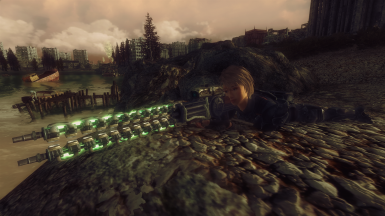 I thought New Vegas do have regular Gauss Rifle? Oh, yeah. That's right. Forgot about that one, because I've always used the YCS-186. I've never used the original. I've been looking a bit into it. And it looks like most of the resources are available in NV. There are only one part/mesh I can't find in NV; The Mesmetron, which i used to make the scope... I have to see what can be done about that. If I decide to convert it. You can just use FO3Edit to acquire the IDs. 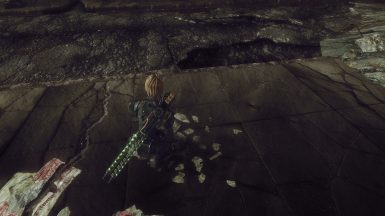 I've added a more challenging way to get the weapon. ; ) Enjoy. please. oh and i love it. I'm guessing you mean the ammo id? I really don't want to give it up openly in the comment section. You can use FO3edit. And find this mod, and find it under the ammunition tab if you want. Before I start this is a great mod and I appreciate the work that you put in it. @Za1zeR And why not? All you have to do is type it in its not like your breaking anyone's game. But no, to find the ID you want people to go and download someone else's program that 75% of us probably won't need and will only use to look up your stupid ammunition id, then load your mod into to that program and then think "damn I just wasted my time installing a program just to find the id of some ammunition for a gun when the author could have simply just told us". Seriously it's not that hard just type into the comments please and save us some time instead of advertising someone elses mod. 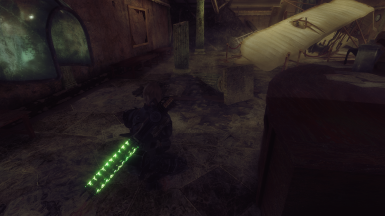 Again I'm not saying this is a bad mod I'm just saying it is stupid that you can't just tell us the ammo id. And if the author doesn't put it into the description could someone else do it please, I don't feel like downloading someone else's stupid program to dig through it and find it thanks. Wow, that's a big wall of text you got there CorporalObvious. I actually think you could have downloaded FO3Edit, found the ID's, deleted it again, in the time it took you to write that. Anyway, I have added them in the top of the comment section. Too be honest, in my humble opinion my good squire. :^) You're both right and wrong. Za1zer could just save people's time which he has done politely by even adding a spoiler alert and stickying the post for the ID's however being the creator of the mod. His own ideology comes first whether you like it or not for his own content. 75% is a pretty big number of people skipping on Mator's xEdit. I think the bigger sin is not having that program installed at all considering how good a program it is for tweaking mods, making personal patches, making a merge patch, solving mod conflicts, etc. Then again, not everything is obvious as it seems. Ignorance is bliss. Very nice. Also, could you tell me what hair mod you used in the screen shots? Endorsed!! And what Chmo2009 said! A single tear rolls down my cheek. Sfter 9 years just one person fulfilled an old dream. I've wanted to create a similar mod for a long time, but I'm too skewed in creating models and quests. But I came up with the concept of the plot: search for an old aristocrat collecting rare technology, an abandoned villa with a laboratory in the wasteland, craft station of special depleted-uranium-cartridges from spent nuclear reactor rods. The model would be similar to an early gauss rifle sample, but with a reload from the railway rifle. Don't know why i writing this, because... one good modder told me "no one will make other people ideas, they have their own ideas, so do it by yourself". But your design is really hot. I enjoy it! An inspirational story. And a very good idea! : P I actually just wanted the rifle finished as quickly as possible. And just made it available at the display case in the Museum of Technology. But your idea would have been very immersive indeed! Thanks for sharing ... and caring. 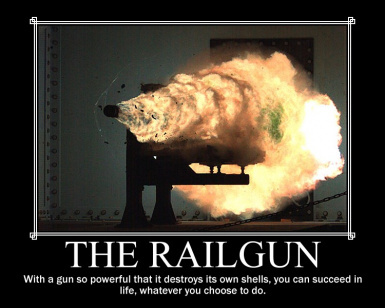 This looks really awesome, i always loved railguns so this is going to be a lot of fun to use! Thanks mate!